Our delightful Jungle Bums Quilt is the happiest quilt ever. Plump bottoms and cute faces make each one a joy to make. We promise you won’t be able to make the Jungle Bums without giggling. 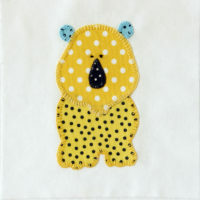 These quirky Jungle Bums are blanket stitched by hand using fusible webbing applique. However, you could stitch them by machine if you prefer. Each block has a thin fold of fabric called a peeper sewn into the seams to enhance the design. 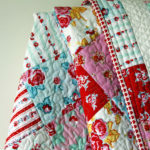 Leftover fabrics are used in the first border. This project lends itself to the whim of the maker. You can use scraps from your stash or follow the requirements list. Let’s face it, bums make most of us laugh. 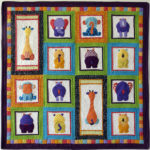 Children seem to find them endlessly funny so this is a fun quilt for kids. Of course, you could just make one for yourself. We won’t tell. Jungle Bums – because everybody loves a happy ending!